Zimbabwe is a landlocked country. At its border, the Zambezi River forms a natural riverine boundary with Zambia. In full flood (February-April), the massive Victoria Falls on the River forms the world's largest curtain of falling water. I had the great honor of being born in the Message, I always saw this equivalent to being born in the ark right before the antediluvian flood destroyed the earth, what a privilege! Our parents lived us a Christian Life that had a tremendous effect on how my brothers and I perceived religion. My Dad, Brother G as he is affectionately known, was enthused by this Message he didn’t sit us down much for talks, but we certainly watched his ways, keenly, and were influenced. He was a selfless laborer from his youth, having been part of a distinct and commendable group of young believers who received the Message in the late 70s & early 80s in Zimbabwe and are holding on strong to this day with many fruits from their faithfulness. Having received the Message at 16 years of age, by 22 he was a pivotal translator in church and by 23 dad was chosen to be the librarian of the just opened VGR office in Zimbabwe at Bro Innocent’s home in Hillside. It was VGR’s first overseas Library. My mom was a perfect partner in every way. She was devout and a dedicated mom, raised us with a firm but loving hand. She spent countless hours with us growing up, teaching us the Word, Bible stories, reading to us Bro Branham’s Life-story, giving solid admonition and praying with us…she didn’t spare the rod either hence the children weren’t spoilt! I can truly say we had the very best. Growing up, I had an active Spiritual Life, at school I wasn’t ashamed to declare what I believed, I saw God personally answering my own prayers as a school child and those experiences personalized God to me. I enjoyed and actively participated in a vibrant Sunday school system, as we grew. The Lord helped me sail honorably through primary and high school. A milestone in my life was, Sunday evening September 2, 2007. It was on a bus with fellow Christian youths; we were driving back home to Harare from a youth meeting we had gone to in Masvingo. I had hoped to have my experience at the youth meeting but got discouraged when it didn’t happen. I told the Lord that I had asked and hadn’t received yet but He knew I wanted to receive the Baptism of the Holy Ghost, and whenever He was ready He could give it. In the mean time I was going to live my life as best as I could. Well, it happened sooner than I thought, right in the bus on our return. We were singing and testifying about the goodness of the Lord and the Holy Ghost came down in there, and sealed me. I have never been the same. That revival season took me to the next level in my walk with the Lord. Blessed Be The Name Of The Lord! Weeks after completing My Advanced Level exams, the Lord opened a prestigious door for me that I thought was going to last my lifetime as a career choice. But God’s plan was a progressive one and quickly shifted scenes… The Lord made me His Prisoner, and set my feet on path of destiny that has been unravelling magnificently. The events leading up to my being hired at VGR were simply divine and rapidly dynamic. A series of testimonies orchestrated by the Master of Assemblies – Christ, directed me to the center of God’s Perfect will for my Life. Serving the Bride in Zimbabwe has been a great honor and a tremendous encouragement and enhancement to my Christian experience. There is no greater honor on this earth. Great things have happened and even greater things lie ahead. As the imminent end draws near, it is thrilling to see The Bride Of Christ uniting around the Word. Preparing to inhabit the Glorious promises of the Things That Are To Be. Until then, our hands will cleave to the Sword, the Full Word that came to God’s Prophet. As that Word gets into the hands of the predestinated, it is being lived out in flesh more & more by His believing Bride, prepared bodies who are Tabernacling God - The Word. Completely yielded and in tune with the Great Divine Program of God for THIS day, we press on, working till Jesus comes. Towards the end of the 19th Century, around 1890, the British under the leadership of a British Citizen, Cecil John Rhodes, colonized this land. The name Rhodesia was then used for this colonized country named after Rhodes. As a result, the official language became English. So when God sent His prophet and raised him up in the United States and preaching in English, it then was a blessing in disguise that we could hear the Voice of God direct without an interpreter. This has helped to deter foreign and wrong doctrines normally associated with trying to translate the Message. For that we give God the glory. In the early 1960s there existed a Federation of three countries, Rhodesia and Nyasaland. Rhodesia consisted of Southern Rhodesia (Zimbabwe) and Northern Rhodesia (Zambia) Nyasaland is now Malawi. This political coalition proved very handy in future trade agreements and good neighborliness between them for years after they attained their own individual independence. As a result, when the Voice of God network was set up in Zimbabwe, it was easy to coordinate the 'tripartite' network of Zimbabwe, Zambia, and Malawi. All are former British colonies and all have English as the official language. Hence English materials for years have been shipped straight to Harare, Zimbabwe and then relayed further to Zambia and Malawi. 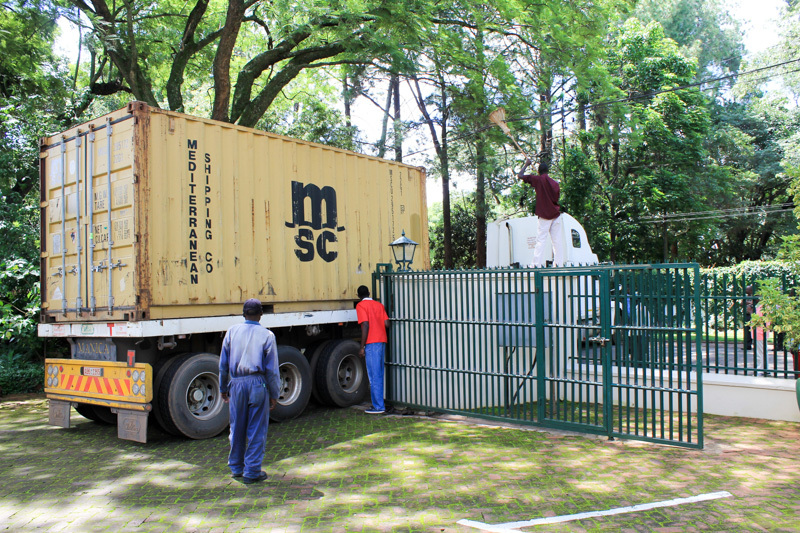 Recently, as a cost-cutting measure, the consignments are shipped through to South Africa where they are further relayed to Zimbabwe, which does the final relay to the countries further north. Just to back track a little: When Mozambique gained its independence in 1975, it provided necessary support for the liberation movements in Zimbabwe. Mozambique became a springboard for the guerillas from Zimbabwe. 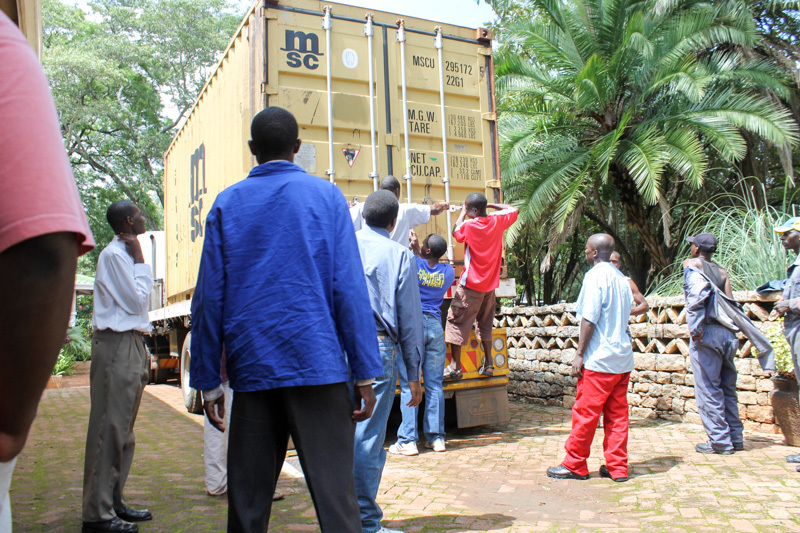 Zambia also provided the same logistical support for the other group of liberation warriors for Zimbabwe. Mozambique was giving sanctuary to a group called ZANLA (Zimbabwe African National Liberation Army) under Robert Mugabe (the current President) and Zambia gave the same to a group called ZIPRA (Zimbabwe People Revolutionary Army) under the late Joshua Nkomo. With cooperation from these neighboring countries, the minority authority in Harare (Salisbury then) was forced to give way to majority rule in 1980. The delay of independence in Zimbabwe was also a blessing in disguise, because the economic infrastructure was put to enviable proportions over the years. Around the time of gaining independence, the exchange rate was US$1: Z$1.50, and the economy was very strong. With that kind of robust economy and one of the strongest economies in Africa, the country was a breadbasket for the rest of the region. Then South Africa remained an oppressed nation to the majority of black people. So the region looked up to Zimbabwe to lead and champion the independence for Namibia and South Africa. This it did, and finally Namibia and South Africa gained their independence, inspired by the success story in Zimbabwe. Internationally it became the destination for most UN, IMF and World Bank projects and became a case study for successful democracy in Africa. Behind the scene though, something more glorious was happening. A lifetime desire of God's prophet and vision was being fulfilled in this small but world renowned country in the heart of Africa. Despite being land locked, the economic infrastructure and efficient transport and banking systems guaranteed satisfactory success. It was during this time that the Message of the prophet of God, Brother William Marrion Branham, spread like a wild fire in the country of Zimbabwe. In 1951, God's prophet made his all time momentous visit to Zimbabwe (Southern Rhodesia, then in Salisbury, now Harare.) Great miracles occurred. Although over the years we have talked and read about A Prophet Visits South Africa, nothing is mentioned about his visit to Harare, Zimbabwe. But praise God, the prophet himself speaks many times about his experiences in Zimbabwe, and also Brother Billy Paul speaks about celebrating his 16th Birthday in Salisbury (Harare). Brother Billy Paul remembers very well about the meetings in 1951 at the tobacco auction floors. The meetings were very outstanding and pivotal in the history of the Message in Zimbabwe. We were privileged though to hear first hand testimonies from two gentlemen who were present in the 1951 meetings in Harare at the Tobacco Auction Floors; these were Mr. Booth and Brother Alex Warrillow. Mr. Booth was a neighbor of Brother Godwin Chitsinde and was a Pentecostal. He was led to come to Brother Godwin's place where he testified at a house meeting. Brother Alex Warrillow was a Pentecostal missionary who later embraced this Message and became acquainted with Brother Chitsinde. We really enjoyed the first hand experience testimonies. I shall refer more about Brother Warrillow later in this report. In January, 1985, when Brother Billy Paul, Brother Joseph Branham, and Sister Rebecca Smith visited Harare and visited the tobacco auction floors, it was almost the climax of the trip. They could all not hold their emotions when they were taken on a tour there by Brother Innocent, who was the point of contact for Voice of God then. After the 1951 meetings in Harare, nothing seemed to have really happened, but the Seed had been sown and the predestinated had been claimed as soon as that prophet set foot on Zimbabwe soil. He later told us that "footprints means possession." From 1951 to around the early 1970's, there was no group as such that had separated itself for the Message except a few individuals who had precious memories of the mighty visitation in 1951. But by then a number of churches had separated for the Message in neighboring South Africa. Around the early 1970's, a Brother from South Africa had made contacts with Brother Alex Warrillo. Brother Alex Warrillow was a director of British descent and also Pentecostal missionary. So when Brother Noddy came to visit Brother Warrillow, he was not at work and was instead introduced to Brother Warrillow's fellow Christian and Christian worker, Brother Samuel Meck. Brother Samuel Meck received the first batch of books on behalf of Brother Alex Warrillow. At this time, Brother Warrilow was very much active in the Assemblies of God church. He shared the books with some of his colleagues, and they soon found out that they had to be re-baptized in the correct way. In no time, they could not go on in that organization, and a non-denominational Pentecostal movement was started. They called themselves Pentecostal Bible Pattern Fellowship. They had this white gentleman, Brother Alex Warrillow as overseer, with a group of some black Brothers that he was working with in the Assemblies of God. Amazingly and simultaneously elsewhere in Zimbabwe, God had been dealing with a former political detainee who had led his colleague to cross the border to join the liberation struggle. His friend proceeded and went for training and rose through the ranks and became one of the 18 men in the then liberation high command. But for the other guy, God had a greater war for him; not only to participate in, but to spearhead. This was Brother Godwin Chitsinde. God worked it out that his path crossed with the people at Bible Pattern Fellowship. Prior to their meeting, Brother Godwin had kind of been the leader of young people who were not satisfied with the Pentecostal and denominational groups and had been searching for the truth. Somehow they had come into contact with the Message, and they did not know that there were other people who had come into contact with the books. Amongst these youthful searching Christians were Brother Claudius Mavengawenyu, Brother Onias Marufu, Brother Charles Mwakutuya, Brothers Francis, and Charles Gabi, along with some other young people. Somehow they came into contact with Brother Warrillow's group, and that became a turning point for the Message in Zimbabwe. However, some of the people were not very serious about separating to the Message. They wanted to go on with a denominational way of operating and denominational life. Brother Godwin Chitsinde could not stomach that, and after a few months of prayer meetings at his rented home in Westwood, the Lord used him to spearhead what could be termed the greatest revival of Message spreading in Zimbabwe. This was in the late 1970's, around 1977-1978. A prayer group consisting mainly of the youthful zealous and honest bunch of young man and women began to separate from denominationalism and showed an unparalleled dedication and commitment to the Message. It was a glorious time. The Lord led many brothers to meet Brother Godwin Chitsinde at different times, and different situations led to some who became ministers or helped establish the Message in one way or another. From this kind of first catch the Lord lit up the fires, and in no time the message was in almost every town in Zimbabwe. Then the rural areas were not spared as well. The Message took ahold of the rural people as well. By 1985, the Message had spread significantly throughout Zimbabwe. In the earlier years, individual believers would write to a number of small suppliers to receive the tapes. The cassettes then were unfiltered and we did not know then the regulations that govern tape duplications and the administrative requirements. All we were interested in was getting that Message into our hearts. Somehow it worked for a while, but it was far from satisfying the great need and the multitudes that were coming into the Message. But it was a tremendous effort that helped the Bride before we started getting the filtered and special Voice of God tapes. This scripture comes into my mind; When that which is perfect is come then that which is in part should be done away with. We are thankful to all those who helped us and also thankful to those who realized a change of dispensation and have since rallied behind the efforts of Brother Joseph Branham through Voice of God. As Brother Joseph Branham mentioned in HERE I STAND, "that he is not able to do this work alone. God has to coordinate the resources and efforts of all interested parties to fulfill this great call of supplying materials to the rest of the Bride." By 1985, the number of Believers had risen to about 2000 in the whole country of Zimbabwe. By then Voice of God was now combined with the Spoken Word Publications. 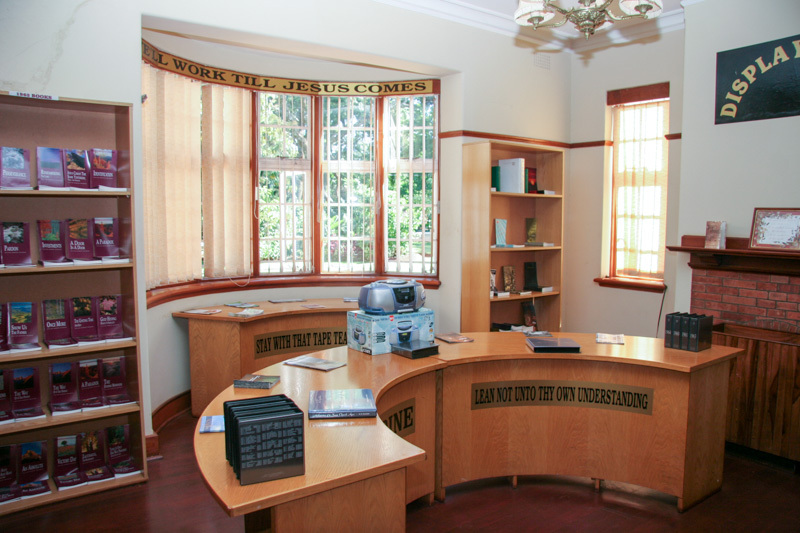 Brother Joseph Branham asked Brother Innocent to consult with the rest of the pastors in Zimbabwe to find a Librarian who would do the work of distributing books and tapes in the Harare office and work full time under the supervision of Brother Innocent. The meeting was held and all the pastors present unanimously agreed to have Brother Gordon Tutani as National Librarian. Thus in May 1985 he started work in a sun lounge office at the home of Brother Innocent. A month later he was joined by the secretary/typist Sister Dorcas Radzingwa Tsoka (nee Mangochi) who was also unanimously agreed by all the pastors present at a Voice of God meeting. Sister Dorcas also happens to be among the group of Sisters who first believed the Message as well. 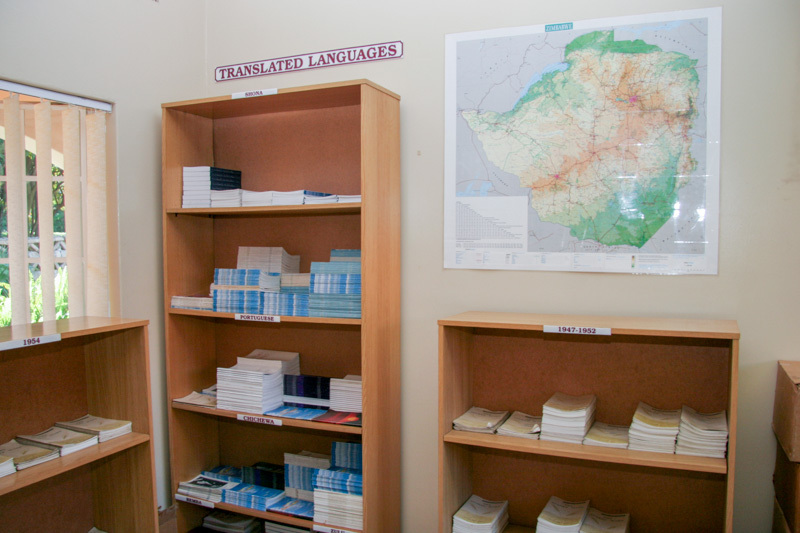 The operations or network started with one Library serving the whole country. Voice of God Recordings started sending boxes of cassettes, which were cleared and collected through local post office. 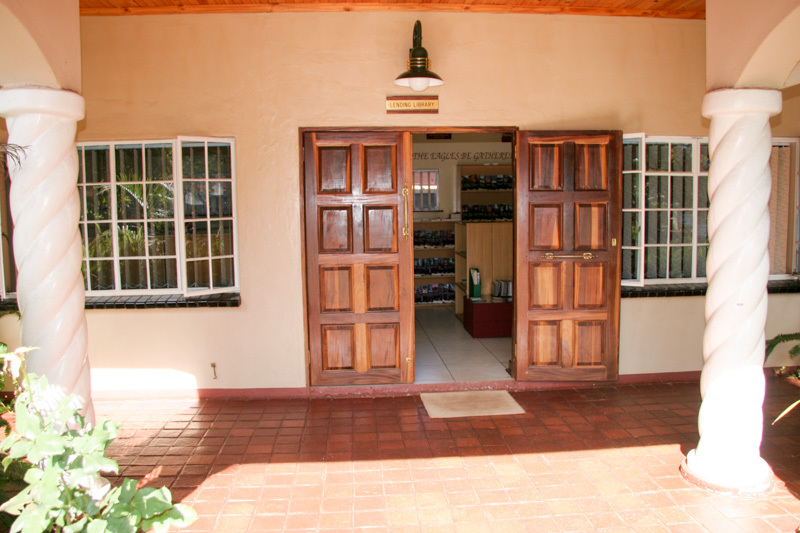 Within a short time the Harare Library was fully stocked with a complete Library. Pastors from outside Harare would come and borrow cassettes monthly on a loan and return basis. The pastors would also help support the work by sending in monthly offerings which would be receipted by the secretary/typist. Voice of God would supply materials and the pastors would support the local requirements in terms of rent and telephone etc. After a while, when expenses escalated and some of the pastors were not able to continue with their obligations, Voice of God took up the burden to make sure no expenses was neglected. We started to receive monthly donation, then later quarterly donations from Brother Joseph Branham. This has been the bulk of funds that has literally been running the work in Zimbabwe. Of course we still have some pastors and individuals that are still faithful in sending in their offerings to the Harare office. May God richly bless them all. We trust more and more will catch the vision and start to locally support the work and even help support the work earnestly. 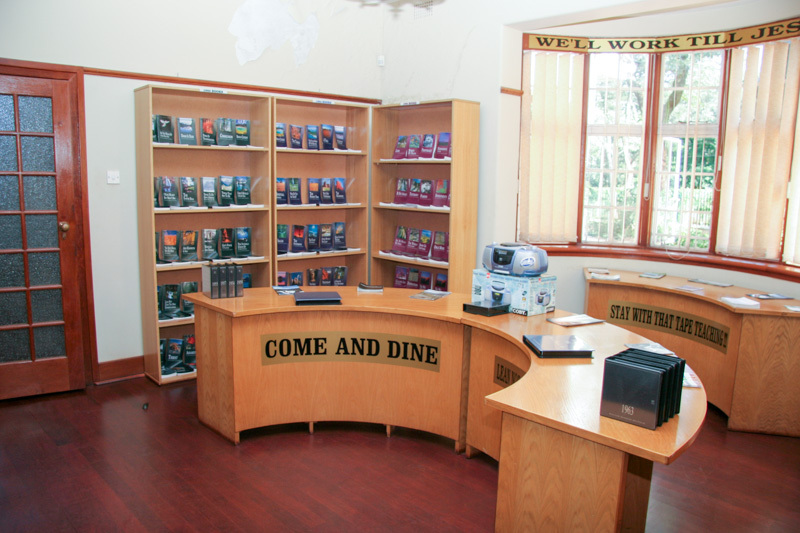 In no time, the Voice of God Library proved to be an oasis and a no-man's-land where every believer and everybody was welcome regardless of church or doctrine. In Harare then there were about 3 or 4 churches and one in Chitungwiza. All these were coming to the Harare Library for their spiritual food. 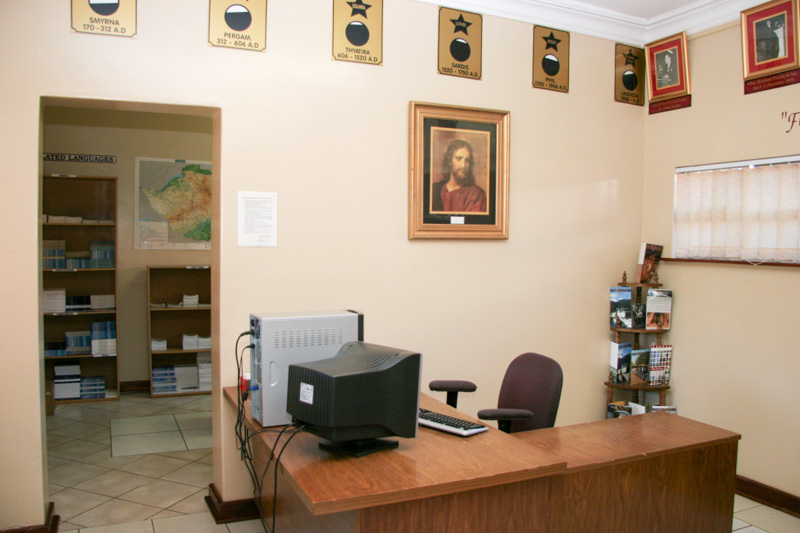 After one year, the Library office was moved from the home office to a town office. Brother Joseph Branham came again in April of 1986 together with Brother Billy Paul and Brother David Branham. This was their second Voice of God visit to seal and give further instruction as to the running of the Voice of God Network. Soon after that, Brother Gordon Tutani was now reporting directly to Brother Joseph Branham to avoid any local influence that might disturb the work. By then the number of Full Libraries had risen to eight. It was not difficult to notice the leadership qualities in Brother Joseph Branham. The same Branham Party came again in April of 1989, where as usual we enjoyed the testimonies from Brother Billy Paul and the instructions from Brother Joseph concerning the work. In 1992, Brother David Branham made a follow up to the work and visited Zimbabwe. It was a fruitful visit as more was accomplished for Zimbabwe after he made feedback to Brother Joseph Branham. We thank the Lord for the association that Brother David Branham has done for the work in Zimbabwe. He remains one of our greatest companions in the Lord's work. Every pastor in Zimbabwe agreed that Brother Joseph was the right man for the job he was doing. They also pledged their support to contribute what they could in monetary terms to help subsidize the efforts to Jeffersonville. As is the case always, some stood by their word and some just forgot about it altogether. But the work continued to grow and to prosper. Written reports would be made every month to Jeffersonville. Letters would be written to the overseas sponsors to make them aware of the fruits of their efforts and how the people appreciated the books and the tapes. But the supply could not meet the demand. The sponsors then felt even more inspired to do more for Zimbabwe. Brother Gordon was able to meet the churches and their pastors and addressed both. Hence the needs were established to be genuine. 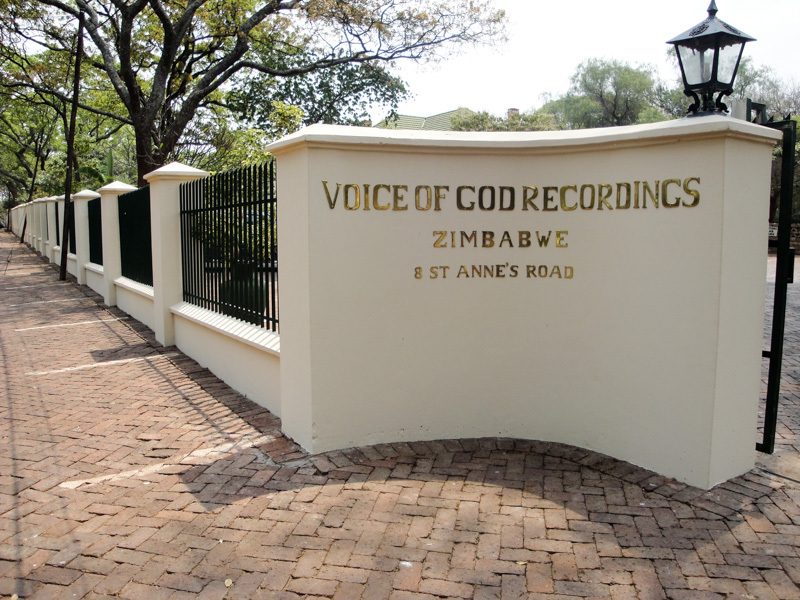 Voice of God recordings has been very generous and very forward in pouring materials into Zimbabwe. When all this was done, other Libraries (Seed Libraries) were set up in other towns. After a year or two, other towns also started to call for attention as well. More Libraries were established in more cities and small towns and rural areas. Free English materials literally flooded the Harare Office of the Voice of God. 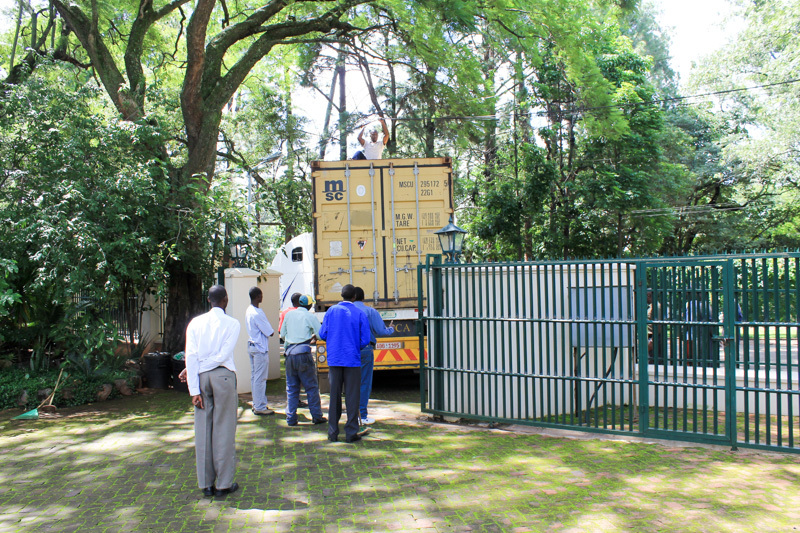 With the efficient road network, it was very easy to transport the boxes to the different towns of Zimbabwe. After a few years, the first group of Seed Libraries were upgraded and stocked to full Library status. This has since been an on going exercise. Every once in a while Seed Libraries are being established. 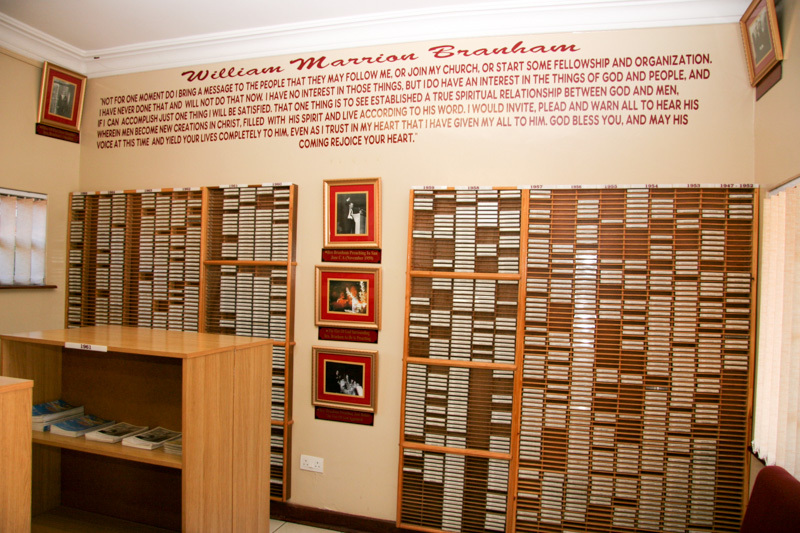 As of now we have a total of 26 Seed Libraries and 19 full Libraries throughout Zimbabwe serving between 15,000 and 20,000 believers. A distribution mailing system was established. In the past, any individual would write to Spoken Word and got materials. But the problem with that system was that either some books ended up in wrong hands misused or abused or not used at all, or real believers who needed the books had insufficient or no supplies at all. Hence Brother Joseph decided to streamline operations and make sure the above wouldn't happen. Praise the Lord the problem was solved. 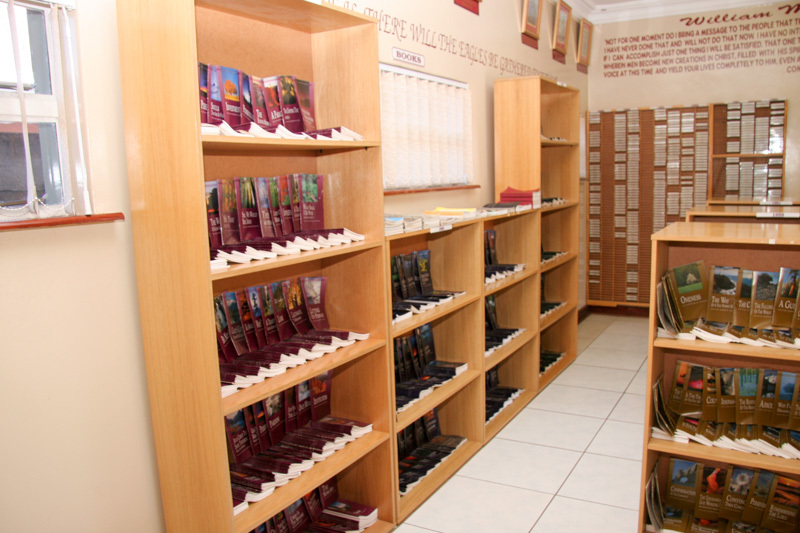 Voice of God then had increased operations to eight full libraries including the main one in Harare. If anybody would write to Jeffersonville from Harare, he would be given a reply including the Names and addresses of the main Library in Harare and names and addresses of every other Library. Then he has to choose a Library nearest to him. In 1994, Brother Joseph instructed Brother Gordon to travel to Zambia and share with them the vision to work with all the Zambian pastors and be able to reach the Zambian people with the materials. Brother Gordon made a countrywide tour of Zambia, and by God's grace all the pastors present at the meetings agreed that Brother Ronnie Kapisha be the Voice of God Distributor and contact person for Zambia. 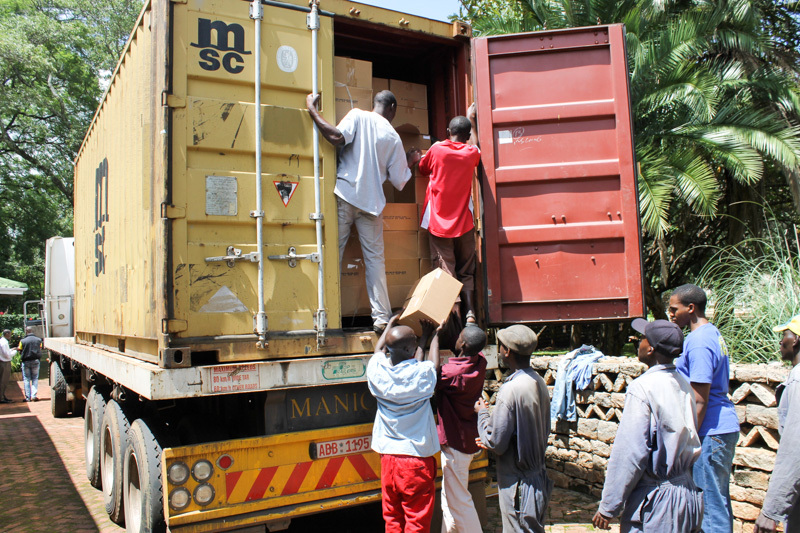 They would be receiving their materials through Harare since Lusaka Zambia is only about 500 kilometers from Harare rather than receive from Dar Es Salaam 2000 kilometers away. Brother Ronnie Kapisha has done a wonderful job of distribution in Zambia. 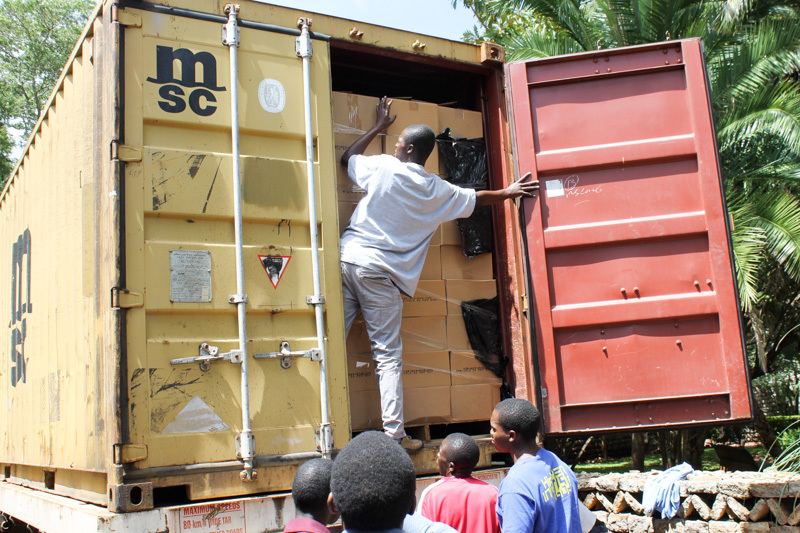 Voice of God has been able to pour in much more materials than before since Brother Kapisha took over the responsibility of the distribution. May the good Lord bless him. The work in Zambia has since been coordinated from Harare. Before Voice of God started operations in Harare, Brother Jeremiah Mkanganwi had a burden to do translation work. 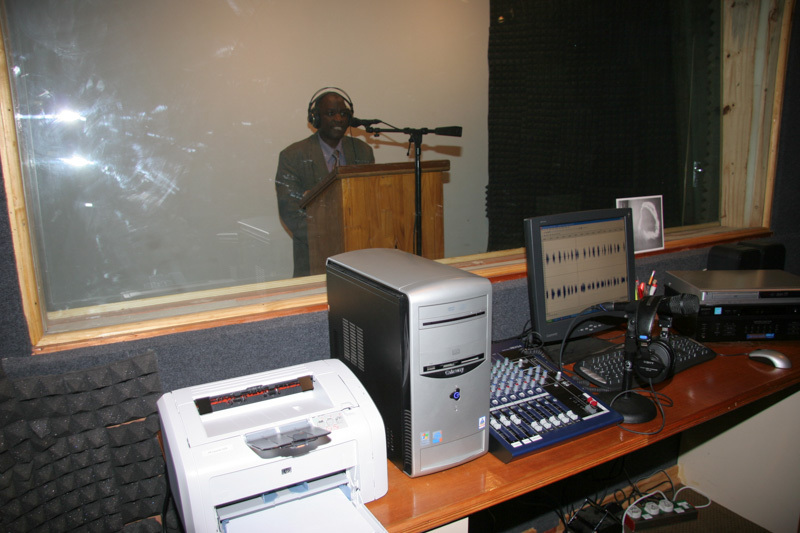 When Voice of God started operations it was easy to bring him into the translation network of Voice of God. Twenty-four Books have been translated so far and twelve cassettes recorded into Shona. The Shona materials became an instant hit with Zimbabwe believers that had problems with English and also some that had problems with the American accent of the prophet. Recently we finished proofreading a tract, BEYOND THE CURTAIN OF TIME and Voice of God has printed it. Soon the tract will be ready for distribution in Zimbabwe. Although we would have by now translated more Shona titles, something seemed to have stalled the work. We believe sooner than later Shona translations will resume in Zimbabwe. The devil is always a fighter against what is right. We in Zimbabwe have been so much blessed by God to receive this prophetic Message and also to have part in the Voice of God distribution network in Southern Africa. May God richly bless you Brother Joseph Branham, Brother Billy Paul Branham and the rest of the Branham family and the troops at Voice of God Recordings and around the world. While there is a threatening hunger and starvation in the rest of the region because of draught and political tensions, there is spiritual food in due season. Our spiritual needs are being fulfilled. We have tapes. We have books, we have CDs, and we have Libraries all over. There is a great awakening of the reality of the Word of God. To the true Bride there is no discouragement. God is still Hebrews 13:8 and He is still Jehovah Jireh. God bless you all the workers at Voice of God in Jeffersonville. May the Lord also bless our overseas sponsors who have had us upon their hearts. While politics and leaders of the world are at each other's throats about Zimbabwe, there is a great work of God going on as the prophet's desire about Zimbabwe is being fulfilled in the eyes of the Lord upon Zimbabwe. Do not forget us. Remember us in your prayers. We rest on God's unchanging hand and ALL THINGS WORKETH TOGETHER FOR GOOD TO THEM THAT LOVE THE LORD. Brother Branham used to say, "It will be alright". Last year when Brother Nathan Jones was in Zimbabwe together with Brother Keith Heine something special happened. When Brother Gordon arranged for the meetings with the pastors and a Voice of God address to the people, the date fell on the 12th of December. That is the date the first meetings were held back in 1951. So it was a perfect Jubilee. The dates just fell at exactly 50 years to the dot. Believers in Harare rejoiced when Brother Gordon mentioned it before the tape service that evening. We covet your prayers to be able to be successful in this project. May God richly bless you and thank you all for supporting of Voice of God in America and Canada and even in Africa and Zimbabwe. A young brother is healed of stomach issues. The Zimbabwe 12-15 year-old youth were invited for a day of their own at the office. The memories of that evening will long remain an encouragement to us. Please go to prayer for Zimbabwe and the believers in that country. Our cups were running over as song after song rolled through our lips. There is a spiritual famine over all the earth. Trips like this one continue to unveil the real hunger and thirst that is there in the Bride for the Word. The Invisible Union of the Bride of Christ is taking place around the world. There is a lot of missionary work going on in the country, as dedicated men of God take this gospel to the jungles of Africa. A laborer in the vineyard goes home. You're in my prayers, Saints in America and everyone else. I just said, “Lord, I don’t have money to buy gas and I can't wait till Friday. Sending the Message around the world. Our hearts are touched each time we receive a letter from someone who received a book or a tape and wants more.